I have a regular assignment book for each student. Usually it's the Piano Town assignment book or, if they're more advanced, just blank paper in a binder. Sometimes I need more information. That's when I use this form. I find it helpful. I don't use it week-after-week because it loses its zip. The first week is amazing - it uncovers all kinds of wonders. Last week I found out that a particularly quiet little girl had hit a golf ball 85 yards. 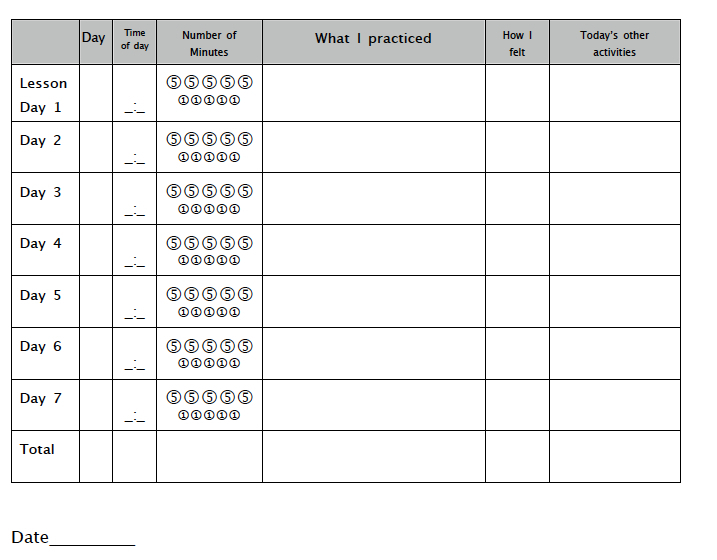 The circles with 5's and 1's represent practice time. They fill in a 5 for each 5 minutes they practice. It makes them think about the time they actually put in. The specific math challenge helps them stay a bit more honest. We practice doing it at their lesson. "Suzy, if you practice for 8 minutes, how many circles would you fill in?" "I would fill in one 5 and three 1's!" Suzy will answer proudly. My favorite part of this particular form is learning more about the lives of my students. Are they happy when they practice? Do they have enough music to practice or do they need more? Are they always tired? Are they over-scheduled? Mix up the information you ask for and how you ask for it. Is there a student you need to get to know more about?